The weeks after Cozy’s death were very hard for me. The hardest part of the ordeal was first receiving the news that my Cozy was terminally sick. The vet told us she only had days, and looking back I think he was right. I think Cozy also finally got me to understand how sick she really was, and then needed to stay to make sure we would all be okay. Either that or she really just liked having eggs cooked for her breakfast every morning. I’d like to think it was a combination of both. During the last two weeks I spent with my Cozy, I struggled daily. I should have been spending as much time as possible with her, but I was so sad some days I couldn’t bear to do anything but sit in my chair and weep. My mind would scream what a waste – she’s still here! so I would go sit with her and weep. Many times I pulled myself together enough and take her outside and take some pictures, some of which have graced these pages. Those pictures meant more to me than just about anything in those first few weeks without her. Looking at the photos I could see in Cozy’s face how sick she really was. How she could have lost 30 pounds without our noticing still haunts me. In retrospect we should have pushed for further tests after that first scary night when Cozy had told me that she was sick, but had we known earlier we would have extended our pain, and Cozy wouldn’t have liked that. No, Cozy knew all along how sick she was. When the vet told us the horrible news, we finally woke up and were able to spend those two wonderful but sad weeks with her. We took some of the best pictures we’ve ever taken of my Cozy during her last weeks, and I cherish them. They are her parting gift to her family. Posting those pictures on Newf Net helped me quite a bit as well. Seeing everyone’s responses made me finally understand what Newf Net meant to so many people, for without it, my grieving would have been much harder than it was. Every day after she left us I would check Newf Net. I could only look once or twice a day at first because every time I did, fresh tears would stream down my face. The painting at the top of this post was done by someone with the user name “Newf Painter” on Newf Net all those years ago. You may notice that it is the same as the photo for the chapter “The Crab”, which is a photo taken on the day we discovered that Cozy had cancer. The artist was so taken with Cozy’s pic that he felt inspired to create this beautiful piece of art, and when he showed it, I immediately offered to buy it from him. He agreed to sell it to me, though he would only charge me his costs for the work. For weeks we struggled. When someone knocked on the door, no one would bark. Daisy had always just followed Cozy’s lead, and now without Cozy to lead her, she was silent. Lauren would get both bowls out to feed them and realize that she only needed one and every time she did this she would start to cry. Even when she finally remembered to grab only one bowl it made her sad. This went on for weeks. When I would sit in the office working on the computer, I would still hear Cozy scratching to come in. Sometimes Daisy would walk in and I would swing around in my chair thinking it was my Cozy. I would still here the bells, and her collar, and her nails on the floor, only none of those things really happened any more. She was gone. A couple of days after Cozy left us, I was working on the computer, trying to get videos of Cozy from the new camcorder to the Internet. My main computer at home has always been pretty substantial in order to keep up with the varied demands I place on it. From music to digital photography to high definition video rendering, I needed a computer that could keep up. I had been building my own computers for years, and had upgraded my system’s speakers recently to full a 5.1 surround sound system that sounded fantastic. While I was working on the video of Cozy running up to the fence greeting me, the rest of the family had left the house leaving only Daisy and me at home. As I edited the video, I came to a portion where Cozy barked her happy bark. At the sound of Cozy barking, Daisy jumped off of the couch and ran to the door, her head up high and her tail wagging more enthusiastically than I had seen in a long time. My heart just about broke when I realized that she thought Cozy was coming home. I realized that I had just given poor miss Daisy a heaping serving of false hope. Daisy was so excited for Cozy to finally come home that it took her a good ten minutes to settle down. I sat and talked to her about Cozy, but I think she was just as confused as ever. Poor Daisy still had hope that Cozy was coming home. Who knows? Maybe having hope was better than knowing the awful truth. The first day that I returned to work was rough. At the time, I was working with a group of people who thankfully understood my attachment to Cozy. I worked through that day in a daze, and don’t remember much of it, but I had to get back into the swing of a normal day-to-day routine, knowing what a much needed distraction it could provide. I vividly remember coming home that first day from work, because for the first time in many years, there was no one waiting for me in the yard. I caught myself feeling happy for the first time all day as I pulled into the driveway because seeing Cozy had always made me feel better at the end of the day. I fell into the routine of perking up as I pulled into the driveway, only to be crushed by the silence. There were no happy woofs, no wags, nothing. My Cozy was gone. I sat in the car and was overcome once more. Never again would my Cozy greet me. Never again would she be able to perk me up at the end of my long commute. How many times had she been there? I had taken her presence for granted and now she was gone. In the past I would have petted her over the fence, then watched as she raced into the house to again meet me by the inside door. I could barely stand the idea of walking inside to again be confronted with Cozy’s conspicuous absence. My Cozy had kept me together for so long that I was pretty sure I didn’t know how to continue without her. I hadn’t realized how much I had come to rely on her until she was gone. While I thought I had come to terms with her death, forcing myself back into my daily routine had shown me that I had not. Normally when I was sad I would go sit with my Cozy, or she would come and put her big drooling face in my lap. I was on my own this time. I still had my health, my family and another dog. I had plenty of people tell me to focus on the good in my life. That felt like an empty platitude told by people who didn’t really understand my sadness or grief. I knew that I still had good in my life, but my sadness overshadowed it all. I felt utterly alone. I was a wreck. Late at night when I couldn’t sleep, I would sit in my chair and watch TV or movies on the big TV. Cozy had always sat with me, or put her big wet face in my lap. She was always there even if just to jingle the bells in an effort to drive me crazy. After she was gone I could sit and watch in peace with no one bothering me. Our house was much quieter than it has been in over eight years since Cozy was the one that had made all the noise. Cozy was the one that first brought life into our house. She was there before the kids and before Daisy. Cozy had left her mark on our little house and her fur and drool were still everywhere. The fence was installed because of her. The doors were all scratched because of her. The hole in the back yard that I swear will one day break my leg was dug by Cozy. To this day, the Cozy hole remains a threat to my tractor and mental stability while mowing. A week or so after losing my Cozy I was up late watching a movie in our new home theater. I felt very alone watching whatever was on; so alone that it didn’t matter what was on. My friend wasn’t there with me. As I sat there watching my perfectly tuned system I was suddenly contemptuous of it. It cost a great deal of money and I had spent a lot of time perfecting it, but without my Cozy by my side it seemed offensive. I decided to watch a movie entitled “What Dreams May Come” starring Robin Williams. The movie relates the story of a man in heaven who travels through Hell to save his wife who had committed suicide. It is a visually stunning movie that won an Academy award or two. Shortly after Robin Williams’ character arrives in heaven he is greeted by his bounding dog which he had put to sleep earlier in the film. The power of that scene for anyone who has gone through the pain of putting a beloved pet to sleep is considerable. For me, having put Cozy to sleep a week prior, it was overwhelming. Usually when I would become overcome emotionally by a scene in a movie I would pause the movie and hang out on the floor with my Cozy for a bit. Often she would sense my distress and come lay her massive head on my lap. This time however, I was alone. As the scene approached I knew what was coming and paused the movie, perhaps unconsciously reaching for my friend who was no longer there. I felt lost. I needed my Cozy. I needed my Cozy because my Cozy was gone. The depth of my loneliness was overwhelming. When I need a break from a movie I sometimes go into my home office and check my email or fiddle with my websites as a distraction. As I blindly walked to my computer I saw Cozy’s heavy metal collar sitting on my desk, still in its unbroken loop. I picked it up and felt its weight. It was cold. I never remembered it being cold before. It had only ever been warm when I would take it from Cozy’s neck for baths or grooming. I held the weight of the collar in my hand and raised it to my face. It smelled like metal and not like my Cozy. There was dirt in between the links and the chrome had worn off in spots from years of use. It was a thing: a cold lifeless thing. It wasn’t my Cozy and it couldn’t possibly provide me with any comfort. Still, I stood there holding it. I couldn’t put it down. It was getting warm in my hands. I took the collar, still carefully looped as my Cozy had worn it, and I sat in my chair and pressed play on the remote. The movie continued and Robin Williams met his long lost dog and I cried like I had cried when my Cozy had died in front of me. My Cozy wasn’t there to help me watch movies any more. There was no big dog to lie with on the floor and no big sloppy head to plop in my lap. Still, her heavy collar in my hands helped soothe me that night. I’ve missed my Cozy on many occasions, but that night perhaps I missed her most. It was my first real step without her and it hurt. Somehow though, even without physically being there, she had helped me through it. Every day was a struggle, but one thing helped me more than anything else; my Cozy had been in pain, and when we let her go she looked me in the eye the entire time and I knew she understood. My Cozy had always been a great communicator, and she had finally made her point to me that the pain was too much for her to bear. I’m glad that I was there to help her one last time. Cozy’s lesson for me, and for the world, was this: Don’t wait to have fun with your dog, your cat, your kids or your significant other. Don’t sit inside on the computer and think “we should go do something.” Go do it! Take lots of pictures and video if you can. I have video of Cozy just sitting in the yard with her Kong. Mundane stuff like that is priceless to me now. Life does go on, but it will never be the same. The trick is to focus on the good, and to see how she can help make the future better. She still affects me daily, but I feel different now. I’m sad because she’s not here, but I can feel her differently than I could when she was here. It’s like she’s a part of me now instead of next to me. Cozy has made my life better and continues to do so. That she has touched you would make her happy as well. Go love your friends now, because I’m here to tell you there is never enough time. Oh, and the thing about my Cozy is that as much as I liked to think and say otherwise, she never really was my Cozy. If anything, I was hers. She did pick me, after all. 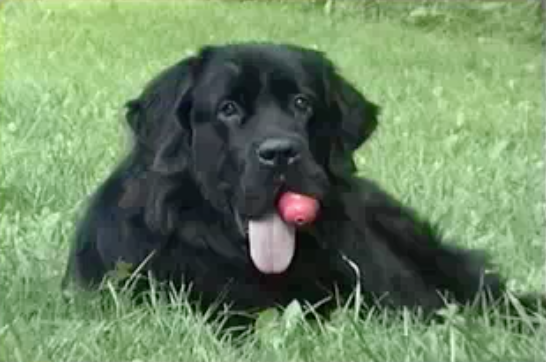 We just lost our Newf on the 15th of September, so I sadly understand your feelings all too well. I was trying to find a bit comfort on the Internet when I found you page. 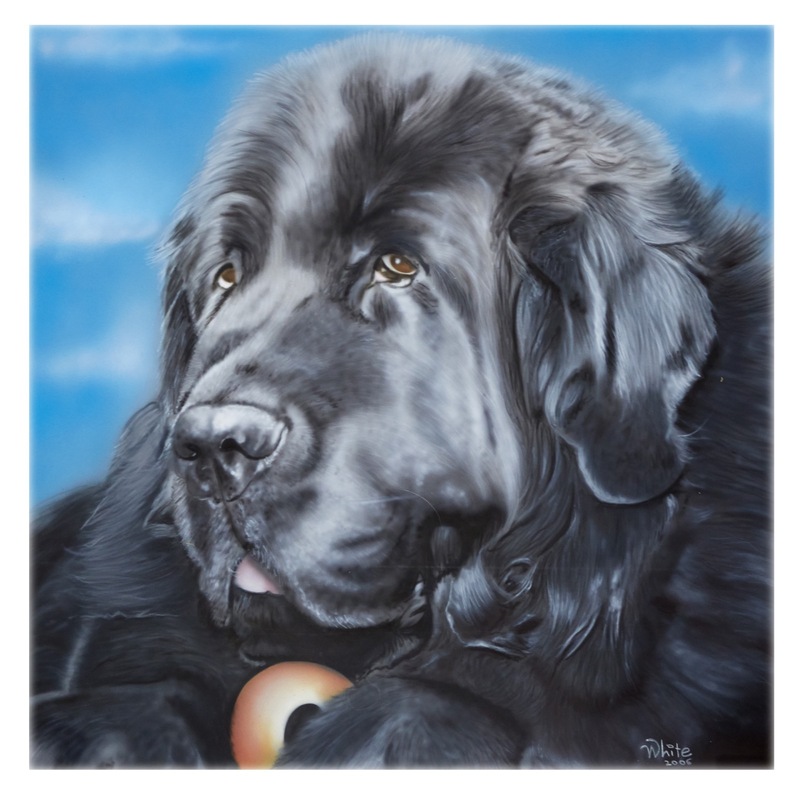 I like to read Epitaph to a dog by Lord Byron, Somehow it feels comforting to know that a Newfoundland all those years ago sparked the same feeling to its owner as any Newf will today. This was a hard read. We had a cat Yochi pass a couple years ago and it’s only been recently that we have been able to talk about him openly, look at pictures etc. without feelings of terrible loss. God Bless you.